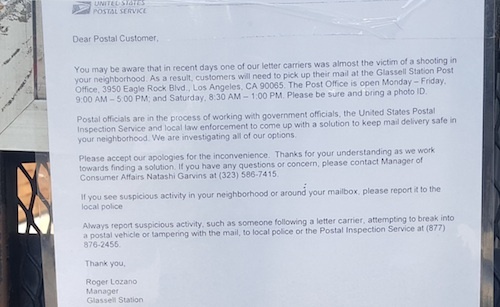 An ongoing investigation into a shooting in Glassell Park has halted mail delivery to the area for several weeks now, raising the frustrations of local residents. A mail carrier was nearly hit by bullets during a shooting on June 27, prompting the U.S. Postal Service to stop mail delivery to residents on a street notorious for its history of gang-related violence. Postal officials cited concerns for the safety of mail carriers as the reason for the stoppage. Since June 28, residents living in the 3300 and 3400 blocks of Drew Street have been without home delivery service. To get their mail, they must go in person to the Glassell Park Post Office, the closest facility to the northeast Los Angeles neighborhood. Rubio, who moved into the neighborhood about a year ago, said he’s glad the postal service is taking precautions, but adds he hopes police are doing their job to solve the case and stop crime in the neighborhood. According to the LA Times, police confirmed a shooting did take place that day, but are not providing any further information. In the meantime, Drew Street resident Elizabeth Espinoza is growing weary of the situation. She said she has no clue how much longer she and her neighbors will have to endure the inconvenience of retrieving their mail from the post office. The post office is not far from her home, but the stay-at-home mom says the traffic on busy Eagle Rock Boulevard makes the trek a burden. While she acknowledges traffic in Los Angeles is inevitable, she says dealing with the hassle of finding parking and long lines at the post office can be overwhelming. “If we come at a bad time” it can take much longer than we expected, she told EGP, clearly unhappy with the situation. USPS spokeswoman Evelina Ramirez said they are communicating with city and local representatives to try to find a better solution. Ramirez said she can’t recall another time when mail delivery was stopped, but added difficult situations are evaluated on a case-by-case scenario. For decades, gang-related violence was the norm in the Drew Street area, but a series of police raids and high-profile arrests of more than 200 gang members in 2008 and 2009 began to turn things around. Soon, more families were willing to come out of their homes and take part in local activities. A notorious gang den was demolished and replaced with community park. The area’s problems did not completely disappear, but the level of violence fell significantly in ensuing years. Over the last couple of years, however, Los Angeles has seen an uptick in violent and gang-related crime, reversing years of decreases. Some officials have been quick to blame the early release of criminals under new Proposition 47 sentencing guidelines and the state’s realignment of the prison system — sending more convicted criminals back to county jails already struggling to house increasing number of inmates under their jurisdiction — for a surge of violent crime over the last couple of years. Late last month, Los Angeles Police Chief Charlie Beck said it appeared the city has turned the corner, and the spike in crime has been abated. 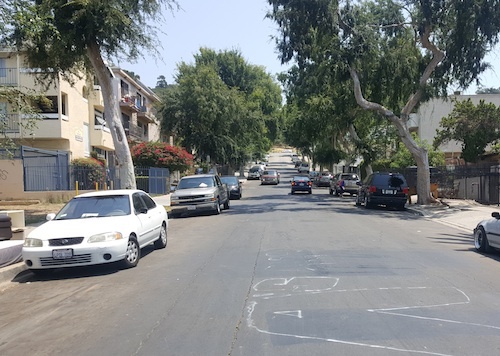 In in the past six months, however, there were 41 violent crimes in the Drew Street neighborhood, 61 percent of them related to aggravated assault, according to the LA Times. The neighborhood, which has seen some of the gentrification and soaring home prices akin to those in nearby Highland Park, still has areas that continue to have a reputation for gang violence. Espinoza, however, believes Drew Street was singled out by postal officials for more punitive treatment.